While most dogs are territorial enough to bark when someone enters your yard or perhaps cranky when another dog gets too playful, these are fairly typical behaviors. 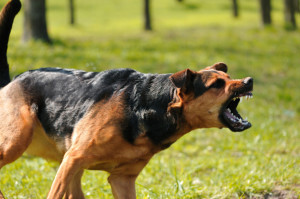 However, if your dog constantly goes into attack mode when other dogs are around or will bite or nip when you try to take something away, these are aggression issues that need to be taken seriously and dealt with as quickly as possible. Aggression issues are perhaps the most serious issues a dog owner will ever face, other than a serious injury or disease. A dog that is aggressive is not a great companion, and unfortunately that’s why these animals often end up at a shelter or dog pound. The good news is that with aggressive dog training, these problem behaviors can be eliminated for most dogs. While working with a trainer is a great idea for any dog, the typical happy pet also can be trained at home using a system such as The Dog’s Way, which is a DVD training system that follows the same techniques we use in our classes here at Seattle Family Dog Training. However, with an aggressive animal, you really need to hire an expert and work with a trainer to eliminate these problems. We offer aggressive dog training, and our approach with the aggressive dog is quite different than what we use to train other dogs and puppies. When it comes to an aggressive dog, it is important to discover why they are behaving aggressively and what triggers this response. It is also wise to visit your veterinarian and schedule a complete physical to rule out any medical conditions that might be altering your dog’s behavior. During aggressive dog training, we teach some basic obedience skills, but we also focus on exposing your dog to his or her aggression triggers and then eliminating the aggressive response to that trigger. Another key element of aggression dog training is helping you and your dog become better partners. We focus on strengthening the bond and trust between a dog and his family. Your dog absolutely needs to see you as his leader in all situations and look to you to for guidance. Part of the problem with an aggressive animal is that they are acting of their own accord rather than following your rules for proper behavior. We seek to build trust between a dog and owner, and this makes it easier to curb aggression. After training, it is imperative that you are consistent with your relationship with your dog. They crave consistency and leadership, and by providing both, you will make your life easier as well as your dog’s life. If you are dealing with aggression issues, give us a call today to discuss your options.